Dillard’s appears set up for “infinity squeeze” like VW in 2008, which sent stock up 5x. Einhorn was short VW in 2008, but is now largest outside holder of DDS. 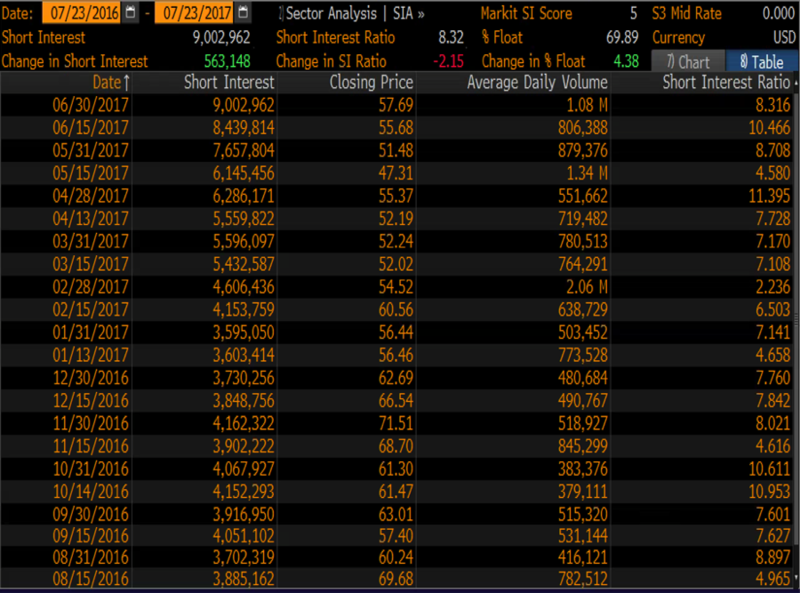 Bloomberg shows short interest at 69.9% of float. But it’s worse. Index funds can’t sell. Einhorn won’t. Short interest now over 100% of effective float. Aggressive share buybacks (ever after Q1) further reducing float without being noticed. Extent of any further buybacks will be announced in 2 weeks. Excluding Einhorn and index funds, as few as 4.38million shares in effective float vs. 9 million shares short. I expect further Q2 buybacks of 1-2 million shares. The math: shorts have now sold millions more shares than they can readily buy back from obvious sellers. Einhorn (or different 3rd party) could recall borrow and trigger massive squeeze immediately. This article is the opinion of the author. The author is long DDS. Note: In general I try to link to free data sources so that all readers can evaluate for themselves without data subscriptions. But this article is very numbers-driven, so I have mostly used Bloomberg data. I have included screenshots to show the data where practicable. Other links can be clicked on from various sources, including Edgar. In making my investment decision, I have done my own math and made my own decision. Do your own math and make your own decision. Buyback: 3 million YTD. Plus 1-2 million more by Aug 10th. This trade is about the potential for a massive short squeeze due to a mathematical imbalance. Shorts have sold millions more shares than are readily available for them to buy back. Someone (the last to cover) will be stuck paying an astronomical price. I am less focused on the fundamentals at Dillard’s. But it is important to at least differentiate Dillard’s from the financially shaky players like Sears (SHLD) or JC Penny (JCP). The short thesis is simple. Online shopping from places like Amazon (AMZN) is replacing “brick and mortar” shopping at places like Wal Mart (WMT). But unlike many of the other department stores, Dillard’s has strong free cash flow and little debt. Dillard’s is trading at just over book value. However, book value only values assets at historical cost, which is decades out of date. Market value of Dillard’s real estate has been estimated at $3-4 billion. Even with a generous haircut to those numbers, Dillard’s is still trading at a discount to its real estate value. There is effectively zero visible bankruptcy risk for Dillard’s and significant incentive for the company to go private. Again, I am not really focused on the fundamentals at Dillard’s. This thesis is about the math that says there are millions more shares short than are in the effective float. In any event, the numbers above arguably make Dillard’s a better long pick than Macy’s (M), Target (TGT) or Kohl’s (KSS). But again, this is not a thesis about the fundamentals at Dillard’s. It is a mathematical trade based on the short interest exceeding the effective float. 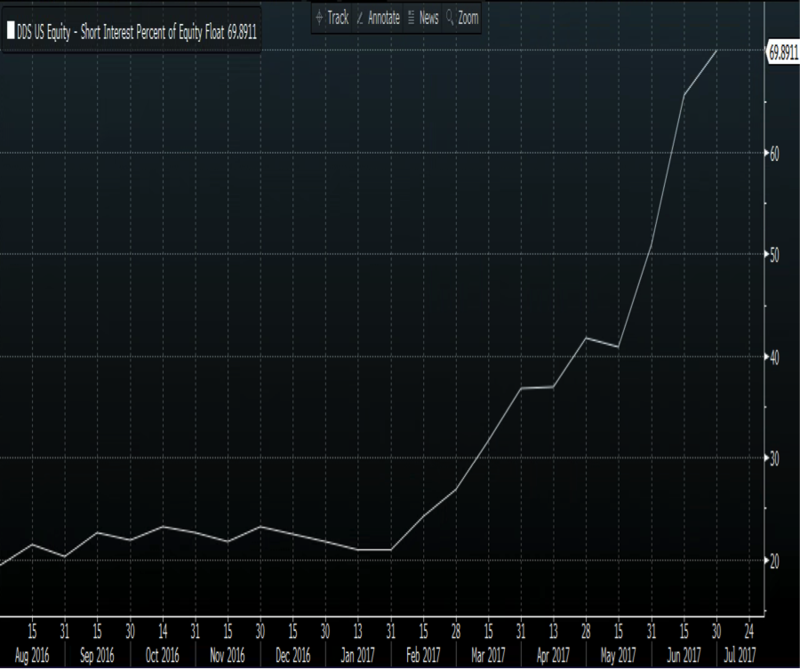 Below we will see how the short interest somehow became the highest in the retail space. For those in a rush, I briefly summarize my thesis here. In the section that follows, I include Bloomberg screenshots and additional links to SEC filings so that readers can do their own math. Dillard’s now appears perfectly set up for an “infinity squeeze” which could be triggered at any time. The most famous example of an infinity squeeze was that of Volkswagen AG in 2008. When Porsche suddenly upped its stake without prior notice, shares of VW quickly rose by a stunning 5x (more than 400%) within days, making it (briefly) the world’s most valuable company by market cap at €300 billion. Hedge funds suffered estimated losses of as much as €30 billion that week, while Porsche reportedly made a profit of €6 billion. As we saw with the VW squeeze, the only thing that matters in an infinity squeeze is when shorts have sold more shares than they can readily buy back in the effective float. At Dillard’s, short interest stood at just 20% in January 2017. No big deal. But then several things happened. Oh but it gets much, MUCH worse than that. Of the 12.88 million share float, as much as 6 million shares are in the hands of index funds (including Blackrock, Vanguard and others) who are typically unable to sell in meaningful size, even when the share price rises sharply. They must generally hold in proportion to their benchmark indices. As I will show below, the inability of index funds to sell their shares was a key contributor to that massive infinity squeeze of Volkswagen in 2008. With index funds largely unable to sell much of their up to 6 million shares and with Einhorn unlikely to sell his 2.5 million shares, the true “effective float” is really as low as 4.38 million shares of readily and likely available shares for shorts to cover their 9 million shares short. Wow. That’s really, REALLY bad. But wait, there’s more. 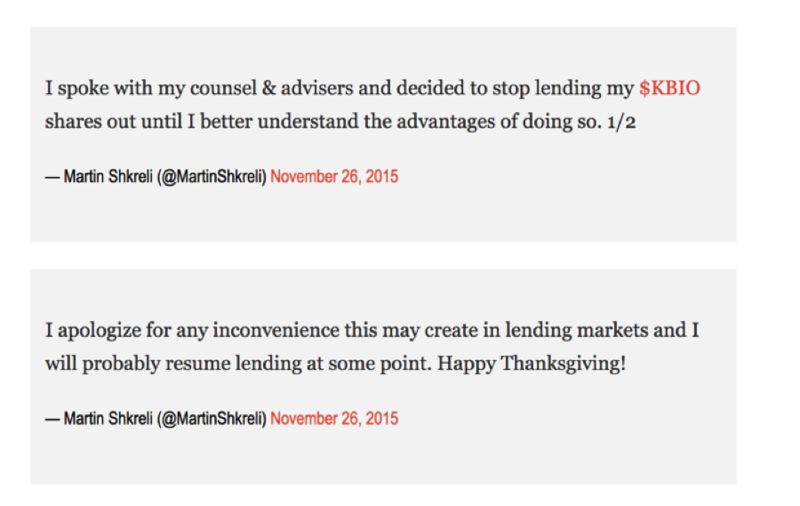 In fact, to the extent that Einhorn has been lending out his shares, he could presumably recall those shares at will. This could force shorts to buy up to 2.5 million shares regardless of price – IMMEDIATELY. And just when shorts are forced to scramble to buy shares, there are simply not enough shares in the effective float to facilitate easy covering. Anyone who is long could simply hold out for astronomical prices and the shorts would be forced to pay. This is what happened with VW and was why Porsche made a €6 billion profit in a single week. Alternatively, the effective float at Dillard’s is now so tiny that any 3rd party investor could swoop in, buy a block of stock and recall the underlying borrow. Given how tiny the effective float has become, such a strategy would NOT require a huge outlay of capital. Any takers ? This is just what “Pharma Bro” Martin Shkreli did with KaloBios (KBIO) in 2015, causing those shares to rise by 100x (yes, 10,000%) from their lows to a high of over $44. As a reminder, if a tiny 1% position rises by 100x then your entire fund goes to zero. With both VW and KaloBios all it took was a single press release or Tweet from the 3rd party investor to spark the infinity squeeze which soared by hundreds or thousands of percent within just days. As we will see below, prior to their gargantuan infinity squeezes, media sources reported that short interest was at less than 15% for both Volskwagen and KaloBios. By comparison, reported short interest at Dillard’s now stands at 69.9% according to Bloomberg. This shows how vulnerable Dillard’s share price is to such a massive squeeze. Ok. So it couldn’t possibly get any worse, right ?! Wrong. It is the ongoing share buybacks by Dillard’s that caused this precarious situation to develop without notice. And with the stock hovering near 5 years lows during Q2, those buybacks have recently been accelerating. A lot. Dillard’s announced Q1 (ended April) results on May 11, 2017. In that press release, Dillard’s announced that it had repurchased 1.7 million shares. This would leave Dillard’s with 26.49 million Class A shares outstanding as of April 29th. But in the Form 10Q which was released 3 weeks later on June 6th, the share count on the cover page was only 25.178 million dated as of May 27th. This means that 1.3 million more shares were bought back in May (the first month of Q2, which will not be fully disclosed until August 10th). This 25.178 million share count number was updated on Bloomberg, but it seems that few people noticed the impact that this would have on the float, especially vs. the rising short interest. There was NOT a press release announcing the repurchase of the additional 1.3 million shares. So during just a 3 week period, investors who had been paying attention should have realized that the float had shrunk by 3 million shares. During this same few weeks, shares short rose by 3 million shares. This is how we quietly got to a staggering short interest of 69.9% apparently without many people noticing. In fact, Dillard’s has the cash and the approvals to have been conducting even more buybacks in June and July. On August 10th, (about 2 weeks from now) Dillard’s will release Q2 results and will reveal how many shares were bought back in June and July. As a reminder, Dillard’s generated over $400 million in free cash flow last year and has aggressively repurchased shares in each of the past 6 quarters. These buybacks have visibly become more aggressive as the share price has fallen. During Q2, the share price continued to hover near 5 year lows. I expect that on or about August 10th, we will see that Dillard’s repurchased 1-2 million additional shares in June and July. If this turns out to be this case, it would further reduce the effective float to as little as 2-3 million shares which would be likely and readily available for shorts to cover their 9 million share short position. The conceptual risk here is that Einhorn or any third party investor decides to recall stock borrow and force a squeeze when so few shares are readily available. Einhorn has been gradually acquiring over several years, but his stake is still just under 10%, meaning that he his not an affiliate. So simply deciding to stop lending shares should not be controversial in my view. Likewise, an outsider could end up triggering a squeeze even by acquiring less than 5% of outstanding shares. This would be far less aggressive that what Shkreli did with KaloBios in 2015. Shkreli has come under tremendous scrutiny from regulators and the media for a variety of his past actions. But so far I have not found any mention of the KaloBios squeeze amongst his current regulatory problems. Either way, even in the absence of such a trigger, I expect shorts to rush to exit their positions in Dillard’s well before the new share count is revealed on or around August 10th. At the same time, I cannot imagine why any longer term holders would be selling prior to August 10th, when the extent of share repurchases is revealed. There are 9 million shares short at Dillard’s but there are only around 4 million shares which are likely and readily able to be bought back. At Dillard’s there are 25 million shares outstanding. But 12.297 million shares are “stagnant” in the hands of various insiders (including Dillard family members) and Evercore (which manages the Dillard’s 401K plan). This leaves only 12.88 million in the public float, as per Bloomberg. Also as per Bloomberg, there are currently 9.0 million shares short in Dillard’s, which already amounts to 69.9% of this stated float. Number of shares short is up from 3.6 million in January 2017. 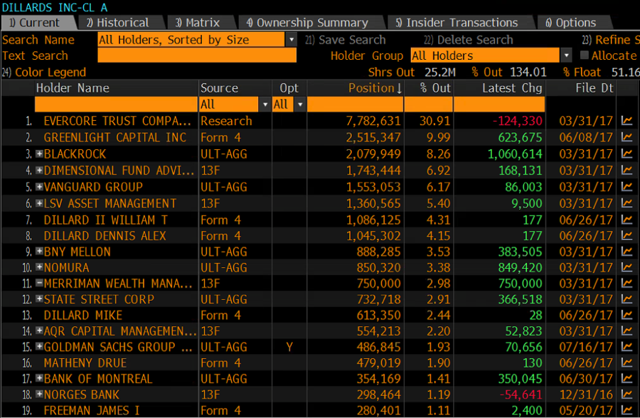 Below is the list of holders of Dillard’s stock from Bloomberg. As I see it, the obvious index funds include Blackrock and Vanguard. Dimensional also takes a hybrid index approach. Even funds such as BNY Mellon and State Street have funds that allocate via indexing. Collectively index funds own as much as 6 million shares. A screenshot of the Bloomberg HDS table is also included below. 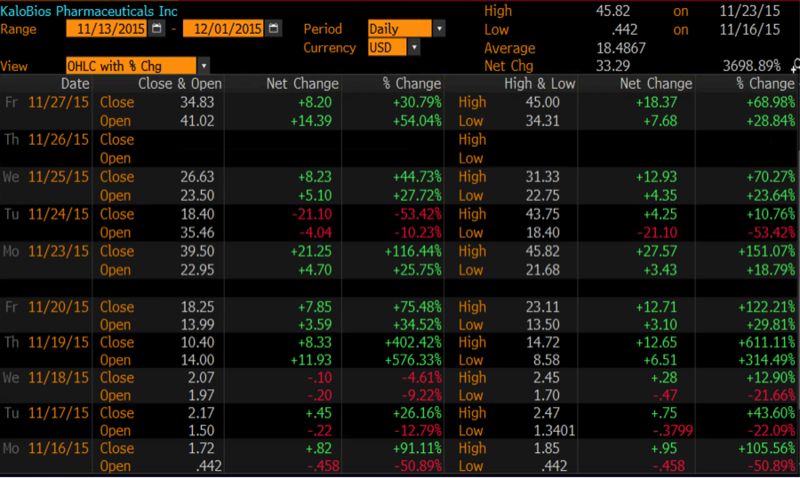 Note that as of the last reporting dates, 18 out of 20 of these holders INCREASED their positions in Dillard’s as shown on Bloomberg. But also note that because some of these holdings are reported as of March and some as of June, we there will be some overlap in the holdings across these periods. This will obviously change over time. As you can see from the HDS table from Bloomberg, Einhorn’s Greenlight Capital increased its stake in Dillard’s by a net 623,675 shares in the past quarter. The reason I assume that index funds cannot for the most part sell meaningful amounts of stock at will is partly just common sense. They are index funds. But also, we saw in the 2008 infinity squeeze of VW, it was the inability of index funds to sell their shares that contributed to the height of that squeeze that saw the shares rise by 5x within just days. We know this because as the squeeze was in full effect, German officials quickly stepped in and conducted an emergency de-weighting of VW within the DAX index, allowing these index funds to sell. By Tuesday night, the establishment was fighting back. Germany’s premier stock index, the DAX, was changed to cut VW’s proportion in it. That allowed index funds to sell stock, adding to the supply of shares, and VW’s shares lost part of their gains. 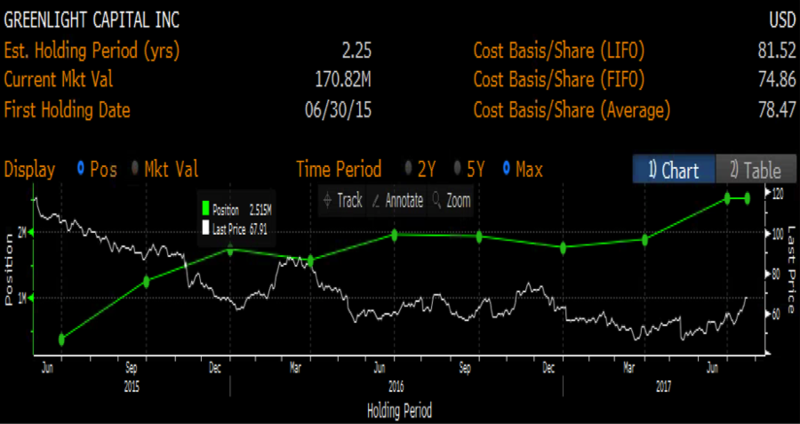 Greenlight’s average cost basis on Dillard’s is listed on Bloomberg at $78.47. And they have been increasing the position in recent periods. Knowing that, in combination with Einhorn’s experience in VW, I do not expect David Einhorn to be selling just to alleviate an obvious short squeeze (unless we see the share price at much, much higher levels). After all…why would he ? So if we decide that index funds either can’t or won’t sell in meaningful size and that Einhorn is also unlikely to sell, there are really as few as 4.38 million shares readily available and likely to be sold for shorts to cover their 9 million shares short. Next let’s look at the share buybacks by Dillard’s which are rapidly shrinking the float. Dillard’s has been aggressively buying back stock for (at least) the past 6 quarters in a row. 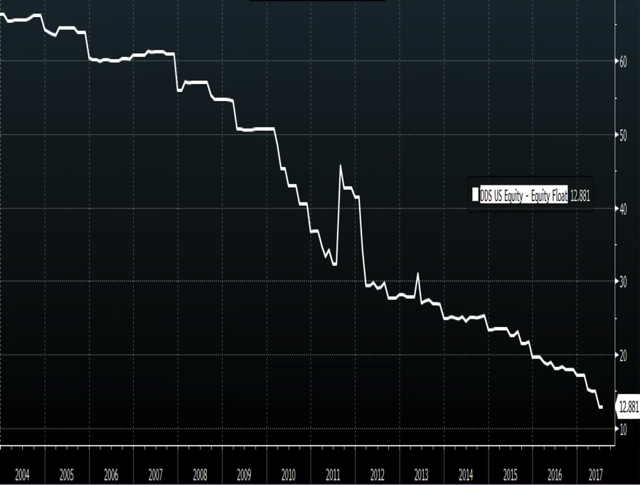 NOTICE how those buybacks have been getting more aggressive each quarter as the share price was falling. Also NOTICE that the share price during Q2 continued to hover near 5 year lows. This is why I expect that another 1-2 million shares were repurchased in June-July. These ongoing buybacks (and the reductions in share count / float) were a major contributor to the short interest rising from 20% in January to 69.9% at present. Just from May through June, short interest rose from around 40% to 69.9%. Just look at the steep trajectory of the short interest vs. float in the chart below, which took off in January and then accelerated from May through June. When Dillard’s announced Q1 results (ended April), they also announced that the company had bought back 1.7 million shares in that Q1. But many people failed to notice that by the time the Form 10Q was actually released in June (3 weeks later), that the share count had fallen by an ADDITIONAL 1.3 million shares, even AFTER Q1 had been fully reported. In other words, just in the month of May, Dillard’s accelerated its buyback, buying 1.3 million shares in a single month, reducing the Class A share count to just 25.178 million. Realize that there was no paragraph in the 10Q explicitly spelling out further buybacks during May. It was just a change on the cover page to the number of shares outstanding. That change was quickly reflected on Bloomberg but it seems many people either missed the change or failed to appreciate its significance. Here is a screenshot from the cover page of the Form 10Q released in June 2017. 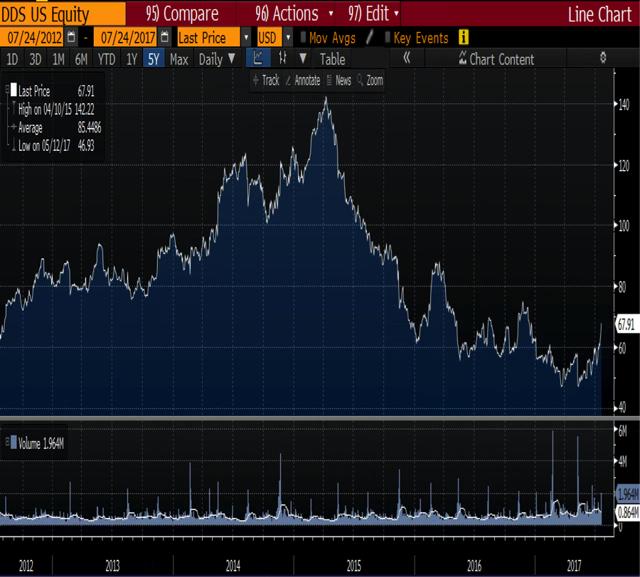 With the stock price hovering mostly near 5 year lows for much of June and July, I feel that it is safe to assume that across June and July, Dillard’s likely bought back an additional 1-2 million shares, further reducing the effective float. They certainly have the cash flow to do just that. Further repurchases would also be consistent with their behavior over the past 6 consecutive quarters. Here is the annual free cash flow for Dillard’s over the past few years. Notice that for the year ended January 2017, Dillard’s generated over $400 million in free cash flow. And remember that Dillard’s ended the April Q1 with over $300 million in cash. In fact, we can see that this pattern of aggressive share buybacks has been going on for years. Ten years ago, Dillard’s had roughly 60 million shares in the float. That has since fallen by nearly 80% to 12.88 million. Scenario A. After more than 10 years of aggressively buying back billions of dollars worth of its own shares, Dillard’s finally acquired all shares and took the company private when the stock was near 5 year lows. Scenario B. After more than 10 years of aggressively buying back billions of dollars worth of its own shares, Dillard’s suddenly stopped buying when the stock was near 5 year lows. You can decide for yourself. But while you’re thinking about it, also consider this. Whatever Dillard’s is theoretically “worth” as an entity, that value is increasing sharply on a per share basis as a result of those buybacks. Some investors may look at “free cash flow per share” others may want to look at “book value per share” to approximate the estimated $3-4 billions of dollars in real estate that Dillard’s owns. Either way, on a per share basis, any per share number is increasing sharply due to the buybacks. Obviously reported “book value” will be very out of date because it only reflects the cost at the time the real estate was acquired in past decades. The market value of the real estate should certainly be much higher than book value. 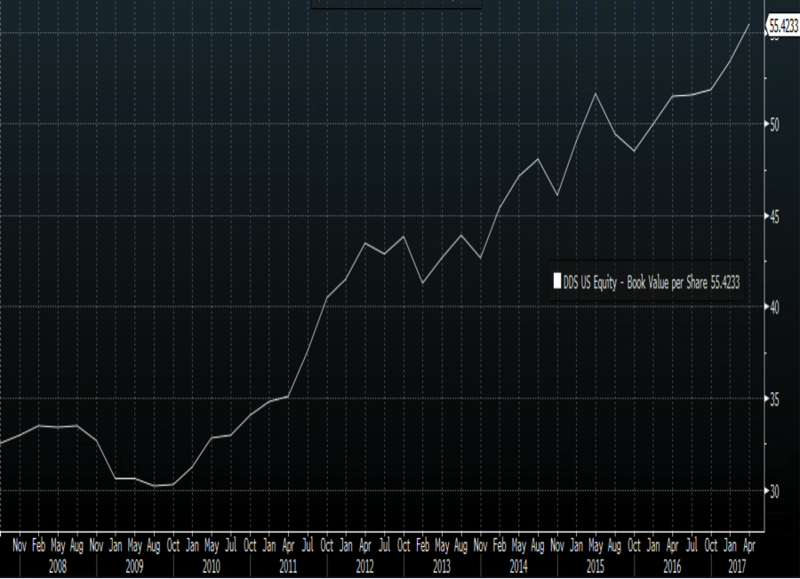 But just to get an idea of the impact of the buybacks on book value per shares, here is the chart from Bloomberg. Anyone who is short Dillard’s need to factor this rising value per share into their target prices. *** What could actually spark an infinity squeeze at Dillard’s (like, as in RIGHT NOW) ? Just prior to the 2008 infinity squeeze on VW, short interest at VW had been reported at just 12.9% of outstanding, which did not seem alarming. For Dillard’s, the reported short interest on Bloomberg was only 20% in January, but it has already risen to 69.9% as of now. That is absolutely alarming. In the Volkswagen squeeze of 2008, the trigger was when Porsche AG suddenly increased its stake without notice. Remember that Einhorn was on the painful side of the 2008 infinity squeeze on Volkswagen. Shortly after the VW squeeze, Einhorn’s subsequent investor letter revealed some valuable lessons for those caught in such a squeeze on how they can live to fight another day rather than going down with the ship. Here is a screen shot from that investor letter which discusses how Greenlight handled the infinity squeeze on Volkswagen (“VOW”). I strongly suggest that anyone who is currently short Dillard’s read that quote from above. And then go back and read it again. The worst trade is the one you don’t want to make, but the one you have to make…..we are unwilling to risk the entire portfolio on a single investment….Though VOW was not a large position on Friday, it became one by Tuesday. The now-tiny effective float means that even aside from Einhorn there is now a very real possibility that a different 3rd party could swoop in and ignite a similar squeeze by simply buying a small chunk (less than 5%) of the stock and then recalling the borrow underneath it. Such a strategy would NOT require a huge outlay of capital. This is exactly what Martin Shkreli did in 2015 when he bought shares of KaloBios and recalled the borrow. Shares of KBIO quickly skyrocketed by 100x (yes, nearly 10,000%) from their lows. The table below shows the 100x rise in KaloBios’ share price following the announcement of Shkreli’s purchase on November 18th. Note carefully that the share price had been rising sharply in the days leading up to that announcement. 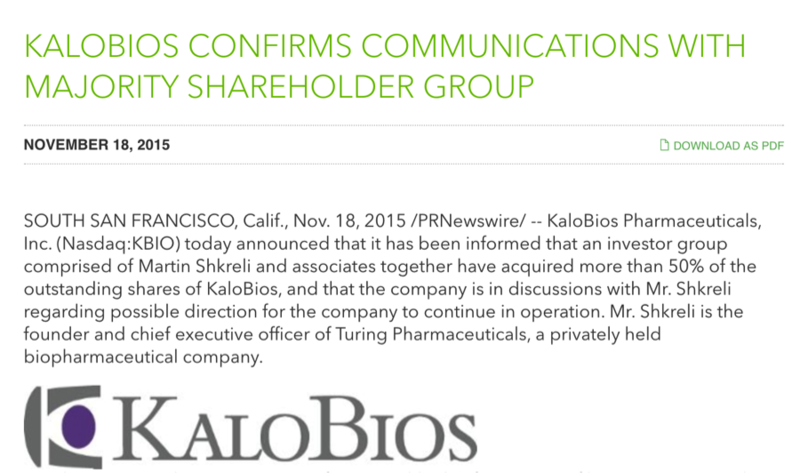 And that KaloBios’ share price quickly soared by 10,000% to a high of more than $44. LOOK at the dates. and then LOOK at what the prices did in percentage terms. When these squeezes happen, they are sparked immediately overnight and then continue squeezing for many days. This is what Einhorn meant about “unwilling to risk the entire portfolio on a single investment” and “not a large position on Friday, it became one by Tuesday”. As you can see above, the squeeze unfolded over multiple days as certain investors tried to “wait it out”, thinking that the stock would have to come back down once the “weak shorts” were flushed out. It turns out that the ones who covered early were actually the ones who made it out with the least damage from this 10,000% rise in just 7 days. The infinity squeeze on KaloBios was made more memorable by retail trader Joe Campbell who started a GoFundMe account to seeking contributions after his $37,000 account lost nearly 400% of its value overnight, leaving him over $100,000 in debt to Etrade. Campbell had been short the stock at around $2.00 at the close on November 18th, prior to the announcement on Shkreli’s purchase. But Shkreli wasn’t content with the rise from $2.00 to the $20s. He wanted more. And any time we see a mathematical imbalance of shares short vs. effective float, this goal becomes very easy to obtain. On Thanksgiving day, Shkreli put out the following tweets, sending the stock as high as $45 (up another 73% in a day) when markets reopened on Friday. KaloBios’ stock had been at just 44 cents 10 days earlier. Notably, short interest at KaloBios just prior to the squeeze had been reported at less than 10%. Obviously this is far lower than the 69.9% we see reported at Dillard’s. Regardless of what anyone thinks about Dillard’s current share price, it is hard to deny the fact that the stock is now extremely vulnerable to a potential squeeze play by an outside investor, similar to what Shkreli did with KaloBios. There are as few as 4.38 million shares which are readily able and likely to be sold by existing holders. But there are 9 million shares short which need to be bought. This situation is already very bad, but it could get dramatically worse in just an instant in a single day if anyone chooses to recall borrow or acquire any meaningful new stake. I expect this aleady-bad situation to get much worse on August 10th when we learn just how many shares Dillard’s bought back in June and July. Again, I am expecting to see additional repurchases of up to 1-2 million shares, which would reduce the effective float to as low as roughly 2-3 million shares even as the number of shares short sits at 9 million which must be covered. Given the cash flow, the real estate and the aggressive buybacks at Dillard’s, a short bet on the stock was already not a particularly bright one in the first place. But given the rate at which the float is disappearing and the potential for an ignited infinity squeeze, staying short Dillard’s now is just plain lunacy. Do your own math. Conduct your own analysis. Make your own decision. *** The shorts aren’t dumb – so how did we get here ? A major contributor to this infinity squeeze setup is just the fact that Dillard’s does not appear to be a “conviction short” for anyone. As far as I see, no one is shorting Dillard’s simply because of a view on Dillard’s. Instead, there are many funds taking small positions of 50-100 bps in each of multiple department stores as part of a vey generic sector short on retail. As recently as January, the short interest in Dillard’s still sat below 20%. It wasn’t really that bad. Yes, the number of shares short at Dillard’s steadily increased. But so did the number of shares short for most department stores. Hedge funds were just spreading their bets around. With Dillard’s, there has been a “triple whammy” which caused a sharp change in the short interest relative to the effective float changed. The sharp change happened fairly quickly without anyone noticing until it was too late. Here again is the triple whammy. The float was already quite low at Dillard’s. This meant that the stock buybacks by Dillard’s had a disproportionate impact on the remaining float. As the float continued to shrink, the significance of the position held by Einhorn and the index funds grew quickly and exponentially. But because Dillard’s was just part of a larger generic sector short for hedge funds, this dynamic was missed by those who were going short. For most investors, their short positions were just too small to merit significant individual attention. Since January 2017, hedge funds steadily increased their short bets against a wide variety of department stores. But with Dillard’s specifically, they were increasing a short bet against a disappearing float and against an effective float that was shrinking even faster (due to the impact of the buybacks). And now there there are millions more shares short than are in the effective float which can readily be bought back. Disclosure: I am/we are long DDS. Additional disclosure: This article is the opinion of the author. The author is long DDS. The author may make subsequent trades in various securities mentioned in this article within the next 72 hours.